There has been a very close and successful cooperation between the Department of Medical Physics in Radiation Oncology at the DKFZ and the Department of Radiation Oncology and Radiotherapy of the University Clinic in Heidelberg. 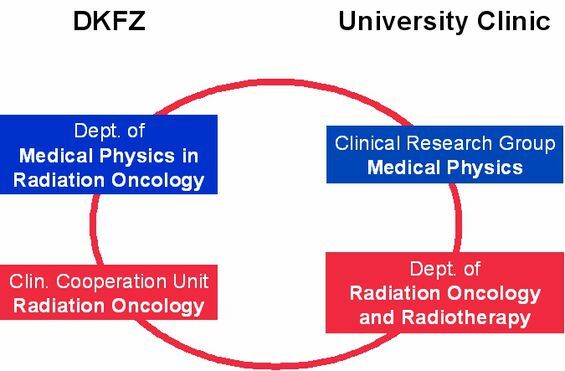 Formally, this cooperation was realized by establishing the Clinical Cooperation Unit Radiation Oncology at the DKFZ, which also consist of physicians from the radiotherapy department of the University Clinic. Many of the modern technologies in Radiotherapy, such as stereotactic radiosurgery, fractionated 3D-conformal radiotherapy, intensity-modulated radiotherapy (IMRT) and heavy charged particle radiotherapy, have been developed in the Medical Physics department and brought into clinical operation together with the Clinical Cooperation Unit Radiation Oncology at the DKFZ. After establishing the new treatment techniques and proving their safety and feasibility, they have been transferred to the Radiotherapy department of the Clinic as a routinely applied treatment technique. 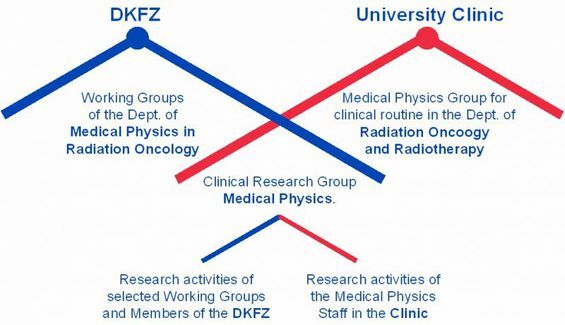 To further improve the cooperation between the DKFZ and the University Clinic in the field of Radiation Oncology, the Clinical Research Group Medical Physics was established. The Clinical Research Group is located at the Radiotherapy department of the University Clinic and is the Medical Physics-counterpart to the Clinical Cooperation Unit at the DKFZ (fig. 1). The Clinical Research Group includes the research activities of the Medical Physicists of the University Clinic and those of selected working groups and some additional members of the Medical Physics department at the DKFZ (fig. 2). to perform joint clinic-related research projects.